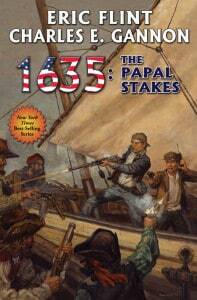 1635: The Papal Stakes was released in October of 2012. It’s springtime in the Eternal City, 1635. But it’s no Roman holiday for uptimer Frank Stone and his pregnant downtime wife, Giovanna. They’re in the clutches of would be Pope Cardinal Borgia, with the real Pope—Urban VIII—on the run with the renegade embassy of uptime Ambassador Sharon Nichols and her swashbuckling downtime husband, Ruy Sanchez de Casador y Ortiz. Up to their necks in papal assassins, power politics, murder, and mayhem, the uptimers and their spouses need help and they need it quickly. Special rescue teams—including Harry Lefferts and his infamous Wrecking Crew—converge on Rome to extract Frank and Gia. And an uptime airplane is on its way to spirit the Pope to safety before Borgia’s assassins can find him. It seems that everything is going to work out just fine in sunny Italy. Until, that is, everything goes wrong. Now, whether they are prisoners in Rome or renegades protecting a pope on the run, it’s up to the rough and ready can do attitude of Grantville natives to once again escape the clutches of aristocratic skullduggery and ring in freedom for a war torn land.